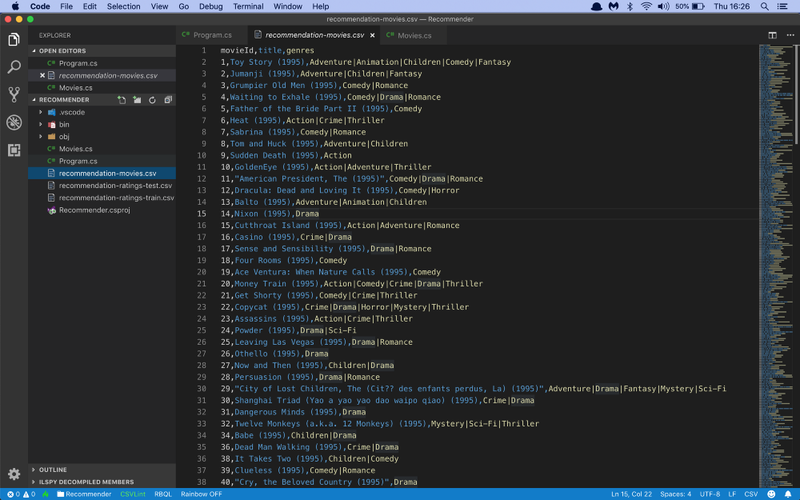 In this article I’m going to build a movie recommendation service using C#, ML.NET, and NET Core. The first thing I need for my movie recommendation app is a data file with thousands of movie reviews to train on. MovieLens has provided a list of 100,000 ratings from their GroupLens project that I can work with. I will build a machine learning model that reads in each user ID, movie ID, and rating, and then predicts the ratings each user would give for every movie in the dataset. So that gives me a list of movies and ratings for every user. To recommend a movie, all I need to do is sort the list by rating and report the top 5. Now I’m ready to add some classes. I’ll need one to hold a movie rating, and one to hold my model’s predictions. The MovieRating class holds one single movie rating. Note how each field is adorned with a Column attribute that tell the CSV data loading code which column to import data from. I’m also declaring an MovieRatingPrediction class which will hold a single movie rating prediction. This code uses the method LoadFromTextFile to load the CSV data directly into memory. The class field annotations tell the method how to store the loaded data in the MovieRating class. MapValueToKey which reads the userId column and builds a dictionary of unique ID values. It then produces an output column called userIdEncoded containing an encoding for each ID. This step converts the IDs to numbers that the model can work with. Another MapValueToKey which reads the movieId column, encodes it, and stores the encodings in output column called movieIdEncoded. A MatrixFactorization component that performs matrix factorization on the encoded ID columns and the ratings. 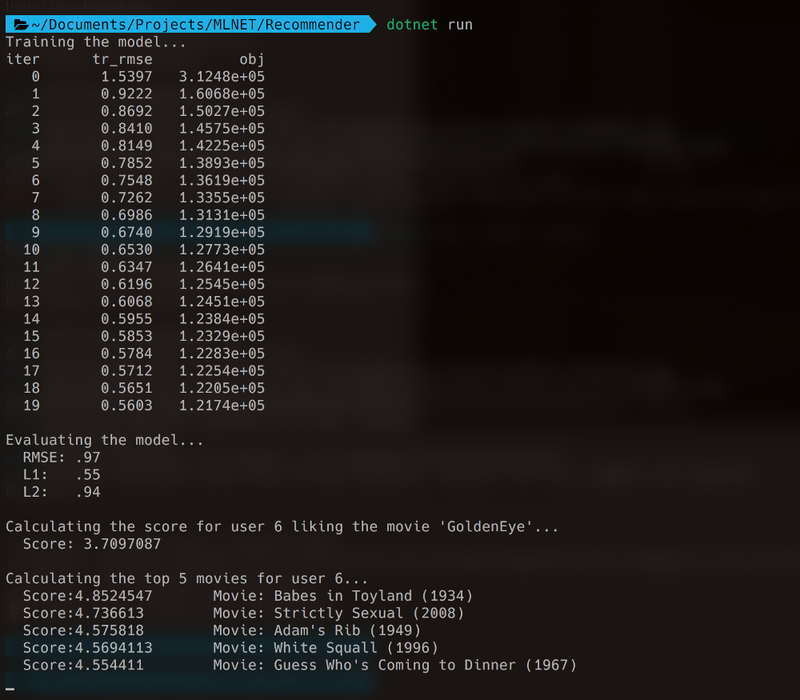 This step calculates the movie rating predictions for every user and movie. 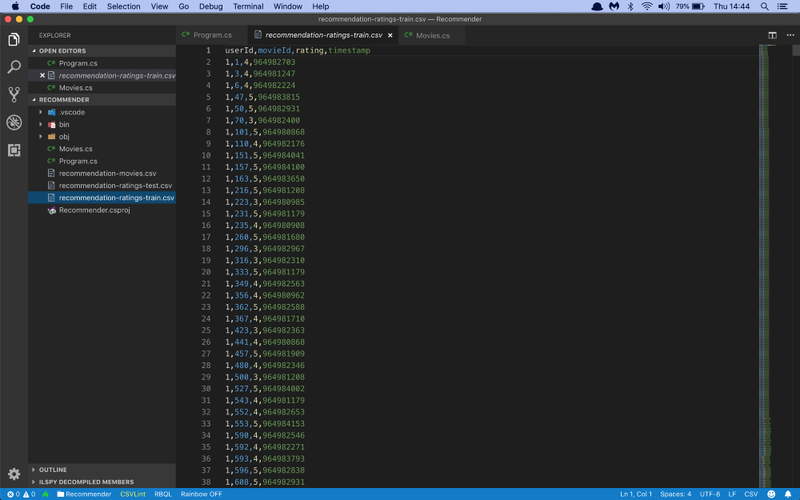 With the pipeline fully assembled, I can train the model with a call to Fit(…). This code uses the Transform(…) method to make predictions for every user and movie in the test dataset. Rms: this is the root mean square error or RMSE value. It’s the go-to metric in the field of machine learning to evaluate models and rate their accuracy. RMSE represents the length of a vector in n-dimensional space, made up of the error in each individual prediction. L1: this is the mean absolute prediction error, expressed as a rating. L2: this is the mean square prediction error, or MSE value. Note that RMSE and MSE are related: RMSE is just the square root of MSE. To wrap up, let’s use the model to make a prediction. I’m going to focus on a specific user, let’s say user number 6, and check if he or she likes the James Bond movie ‘GoldenEye’. 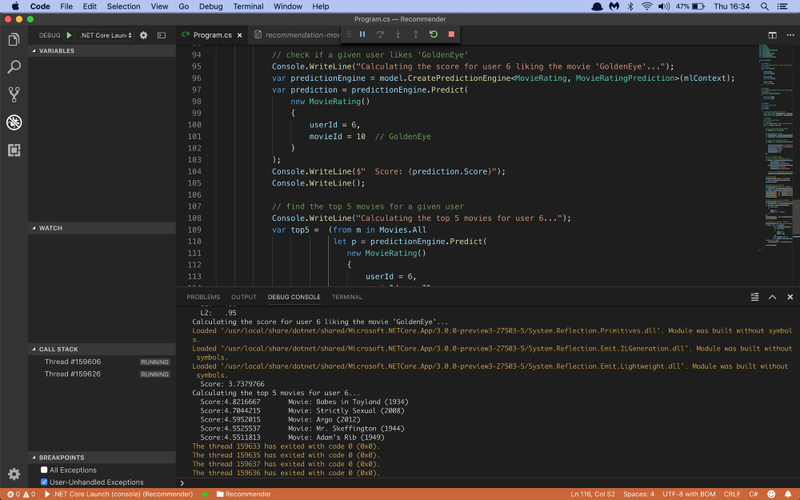 I use the CreatePredictionEngine method to set up a prediction engine. The two type arguments are the input data class and the class to hold the prediction. And once my prediction engine is set up, I can simply call Predict(…) to make a single prediction on a MovieRating instance. This code uses a static helper class Movies to enumerate over every movie ID. It creates predictions for user 6 and every possible movie, sorts them by score in descending order, and takes the top 5 results. There’s a Movie class that represents a single movie. The static helper class Movies has an All property with a list of all movies, and a Get method to lookup a single movie by ID value. After 20 epochs of training, my final RMSE on training is 0.5603. A quick check on the validation data gives an RMSE of 0.97. These numbers are a bit far apart which means I need to take another look at my data partitioning. The mean absolute prediction error is 0.55, which means that this model will make movie rating predictions that are on average 0.55 rating points off the mark. You can easily make predictions for yourself. Just add your own movie preferences to the end of the data file and run the training again. Then make the predictions for your own user ID. And this recommendation algorithm will work on any dataset of users, products, and numerical ratings. We’ve used Matrix Factorization in this example, but there are two other recommendation algorithms you can use to make predictions. 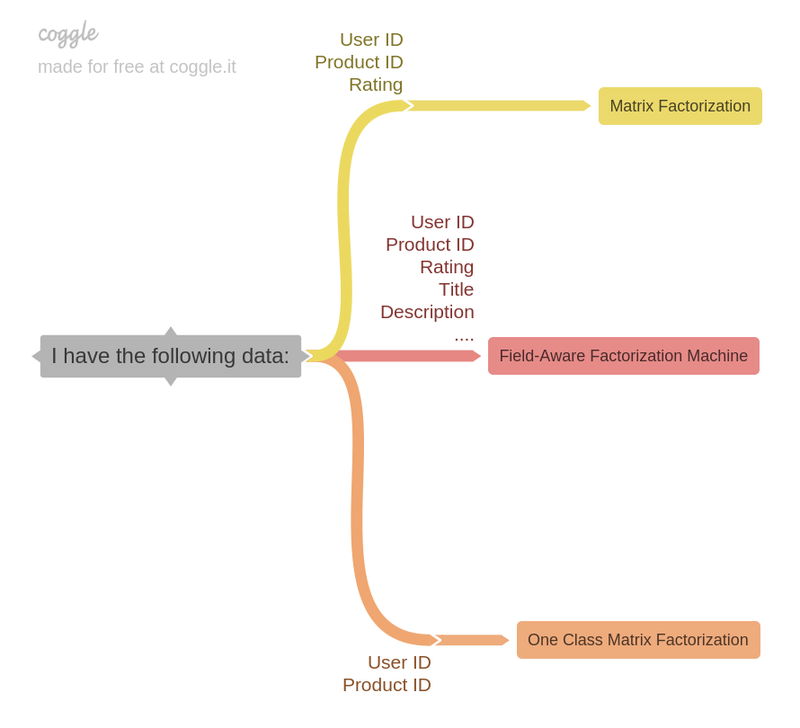 If you have user IDs, product IDs, and ratings, then you can use Matrix Factorization like in this article. However, if there are no numerical ratings in the data file (i.e. likes, purchases, etc), then you need a One-Class Matrix Factorization. And if you have ratings but want to include other fields into the training too, you’ll need a Field-Aware Factorization Machine. The MLNET machine learning library has support for all three algorithms. Add a comment and let me know!